I have a soft spot for 'Jimmy Aaja'. It's quite probable though, that this is due to me liking M.I.A. and having heard her reworking of the song prior to the original. Bappi's is cheesy as hell, but memorable and kind of fun. Elsewhere... well, 'Disco Dancer' [review]  is a bit of a weird one. The music is Bappi Lahiri at his best, or worst, depending on whether or not you like his 80s disco output. I don't, for the most part. Stuff like the oft-lauded title track and 'Yaad Aa Raha Hai' tends to leave me cold. There's also his incessant stealing of other people's songs, which I don't object to in principle, as long as the end result is good and not horrible. His version of The Buggles' 'Video Killed the Radio Star'... I'm not having that, at all. But then I look at the mind-bogglingly camp YouTube clips, and all the above songs suddenly start to make more sense. Go figure. Haha, to each his own then :-) I can think of plenty 80s disco I'd rather listen to than this. In fact, I might dig out some when I get home later. This cheezy... mmmmnh.... This epitome of cheeze will likely forever cause Bollywood fans to fight (to the death!) (and beyond!) between those who dig flicks with shallow values and goofy visuals and those looking for the weepy, 600-Kleenex gravitas of "Mother India." Best to take this thing on its own terms because any more than that and your head will righteously explode. Actually, the same goes for each and every B'wood flick in which the aggrieved hero is also, automatically, the best driver/pilot/marksman/dancer/singer/kung fu expert/pugilist/astronaut/scientist/looking. Mind you, anything that gets you Zeenat Aman at the end of the day is automatically a good thing. Thanx as always! Interestingly this score was a huge hit in USSR - the undivided Russia and China! How'z that for a fact - the next big hit in Russia after Aawara (1951)! 1) Can you please post Ek Shriman Ek Shrimati next ?. I know it either may a) not be ready as of yet or b) not be in the interest of others here (unless you get more requests), but I was very happy to see it on your pics page...it's a great soundtrack !. 2) How many more K-A albums do you have left ?. I love K-A and am glad you have a lot of their soundtracks. I've yet to rip Ek Shriman Ek Shrimati, so there'll be a couple of other ones first - it should be ready within a few weeks though. And I think I have half-a-dozen or so more KA's to go. I do not understand how this could have been so popular (this is true of all Hindi movie disco music). It makes my ears bleed. I absolutely love this album! It's more than worth the three dollars I purchased the CD for. Have you got "Namaak Halaal"? Awww. The SaReGaMa CD cuts it to shreds, but it's full of exceptional Lahiri moments. Film ain't bad either: Another great showcase for the righteous pairing of Amitabh & Kishore. Strangely, though I was a big M.I.A. 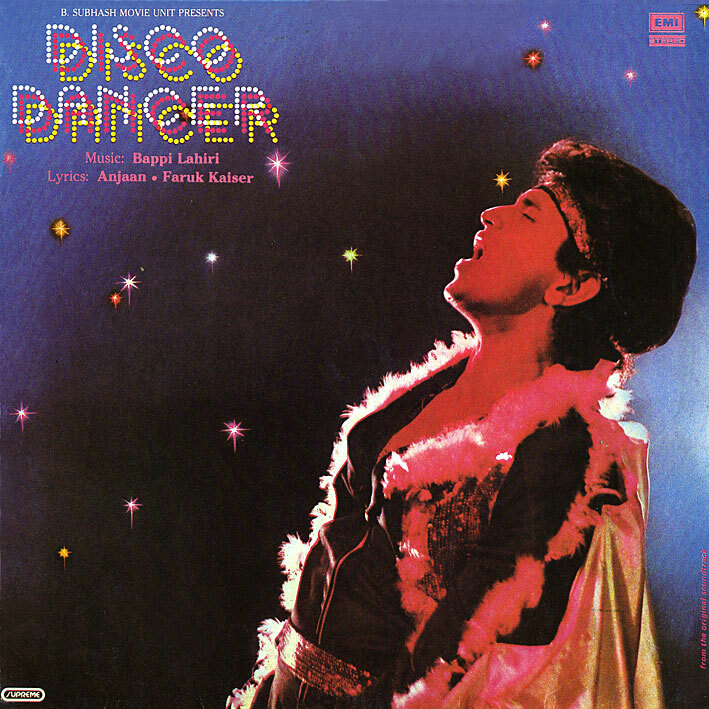 fan for a while (and still like her), I don't care for Disco Dancer the soundtrack and I could not get past the first quarter or so of the film. Actually, I was never that crazy about "Jimmy," either. But M.I.A. was certainly an influence on my immersion into filmi fandom a couple of years ago (before my tastes started drifting way back in time to the '40s and '50s), and there are other M.I.A. songs I like much more than "Jimmy" that sample from Indian soundtracks - though they're Tamil soundtracks, not Hindi. One is "Bamboo Banga," in which she samples a song from Ilaiyaraaja's Thalapathi soundtrack - and I think it's brilliant. She also does nicely sampling from the Telugu music director R.P. Patnaik in her song "Bird Flu." No argument there, there are many way better M.I.A. tracks than 'Jimmy'. Yeah, Bappi went all out on this one all right: Jimmy from Ottawan, Koi Yahan Nache from the Buggles, and Krishna Dharti Pe Aaja Tu from Cliff Richard's "Jesus Won't You Come Back to Earth" - and the titles almost mean the same thing too! Goron Ki may be the only "original", LOL. But I must admit, my parents owned the LP and I grew up loving the music from this album. Just goes to show, we all make mistakes at some point...!